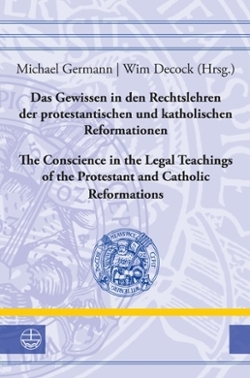 Wim Decock, CSLR Fellow and Assistant Professor of Legal History at the Universities of Leuven and Liège, Belgium, co-edited, with Michael Germann of the University of Halle, Conscience in the Legal Teachings of the Protestant and Catholic Reformation (Evangelische Verlagsanstalt, 2017). According to the abstract, "The essays investigate the role of the religious reform movements since the 16th century in the transformation of the Western legal tradition, focussing on a popular topic: how jurisprudence had to deal with the reference to conscience, virulent for all confessional positions. Research on the teachings of Lutheran, Calvinist, and Roman Catholic theologians and jurists from the 16th to the early 18th century, most often examined separately, is brought together in a comparative perspective. The essays comprise studies on legal concepts of conscience and on their implementation in the teachings in public law and in Canon or Ecclesiastical Law from the perspectives of theology, law, and philosophy."